The 49ers offensive unit spent the majority of the time in “A” during the 1998 replay. 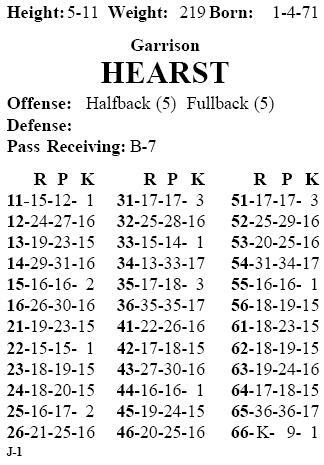 This combined with Garrison Hearst card, estimated 5.3 yards per carry, contributed to his 6.6 yards per carry. As you can imagine, I prefer accurate results but you are correct about the added excitement. I actually like the accurate results too but I also like not knowing what is going to happen…example…Ken Anderson should have really close numbers to the actual ones he had but you dont know in an individual game. This makes it fun because you never really know who is going to win a game etc…but the law of averages works out in the end. This is what makes APBA great…Question….I am just getting back into APBA. I am 47. I had a ton of the old games and my mom threw them out…I was crushed. I have nothing so getting ready to start playing and collecting again. How do the new games stack up? I love the old football game but also played a ton of baseball and even owned the old baskteball game. IMO they are much improved compared to the old boards (pre-1982)…welcome back into the fold!! True statement regarding “each” game being different and the cumulative statistics.